Finally, the bag large enough to carry your beastly laptop in the convenience of a wheeled trolley. This bag offers all of the intuitive spaces, design and performance you’ve come to expect from EVERKI, now available in a rolling design for maximum capacity and convenience. 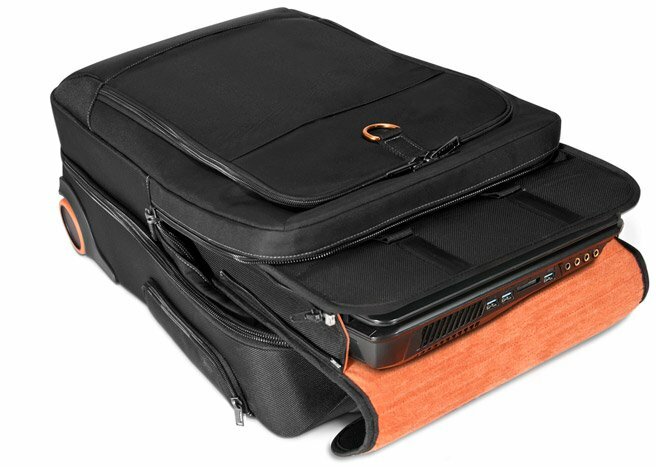 If you’re looking for a rolling solution for an 18.4-inch laptop, you’ve found it in the Titan Laptop Trolley. Because a large laptop may be difficult to travel with – we’ve designed the Titan Trolley to fit the most beefy laptop, with the ease and agility of a trolley, and is sleek enough to carry on board. With places to put all your peripherals, and our signature orange interior, you’ll be able to find them easily and quickly – even in a dimly lit cabin. Also, take other equipment along, like a small projector and an iPad Pro/tablet. Plus, with the Titan Trolley, the bag will pass through security quickly and easily with its removable laptop sleeve. Look no further. The Titan Laptop Trolley is all this and more. Like all EVERKI bags, the Titan Laptop Trolley is engineered with user-friendly design for intuitive organization. The smart organization of the Titan Trolley makes this bag perfect for traveling with multiple devices and all your gear. 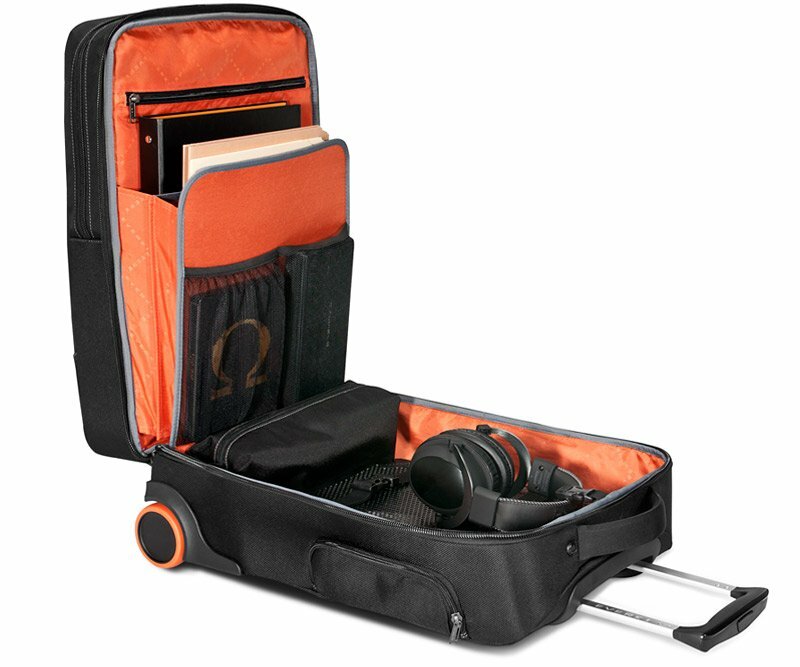 Not only does the bag carry an 18.4-inch laptop safely and securely in the padded and removable sleeve; but there’s room to take along headphones, a small projector, a tablet and more. We’ve designed spaces for smart organization, buckles and straps positioned for on-the-fly adjustments, and pockets, pouches and slots for fingertip access. We’ve included large, divided spaces to keep chargers and power supplies separate from fragile files and documents. The felt-lined tablet pocket safely secures an iPad or Kindle, while the front compartment holds business cards, pens, calculators or peripherals. All of this rolling on our super-quiet wheels for the airport or your daily commute. Inspired by the Titan backpack, EVERKI’s flagship bag for the 18.4-inch laptop, the Titan Laptop Trolley has the same durable materials, spacious capacity, quality, versatility and innovative design. 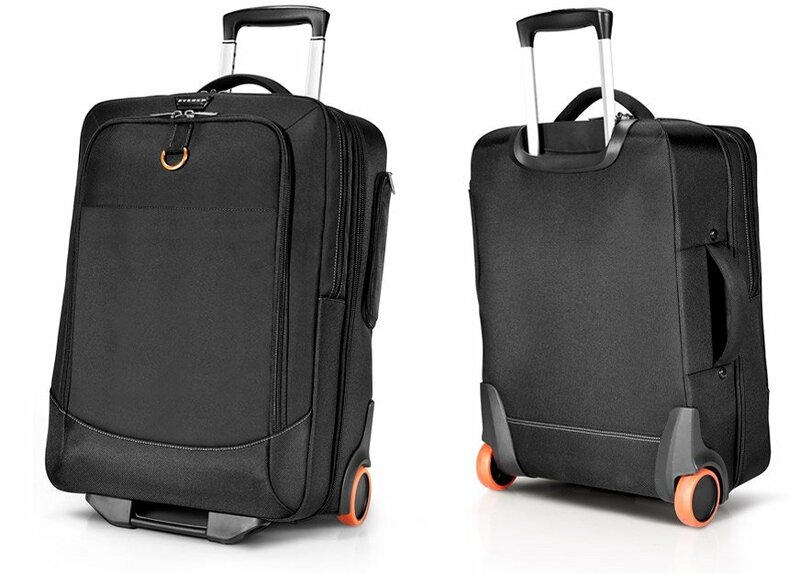 Now the Titan comes in a trolley model so you can wheel your bag quickly and easily through busy airports and walkways. Engineered with sturdy, low-profile wheels that are inset into the bag for a smooth, quiet ride and sturdy construction for heavy-duty use. 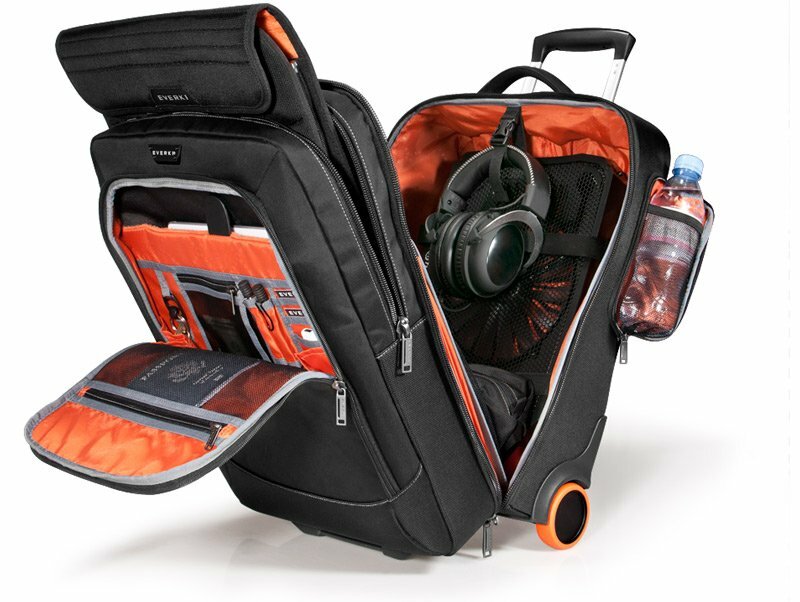 And even though the Titan Wheeled Trolley is large enough for the most behemoth laptop, it’s designed to be a carry-on at just 20.3 x 14.2 x 8.9 inches. Airport security can be a hassle, so we designed the Titan Laptop Trolley with a removable laptop sleeve to help make the process as smooth as possible. The padded laptop sleeve has handles on the top so you can grab your laptop out of the main compartment, place it on the scanner, and pass through security quickly and easily. Best of all, the laptop remains completely enclosed and protected - it’s never exposed to curious eyes. Traveling with a smaller laptop this time? The sleeve zips up on both sides to fit a smaller laptop, keeping it safe and secure. Ultimate convenience, ultimate protection. If you need room in your carry-on for multiple devices or equipment for a presentation, the Titan Laptop Trolley is just right. We constructed the spacious main compartment with hard-core technology users in mind, with a strap to hold headphones in place, and plenty of room for a projector and 3-ring binder. 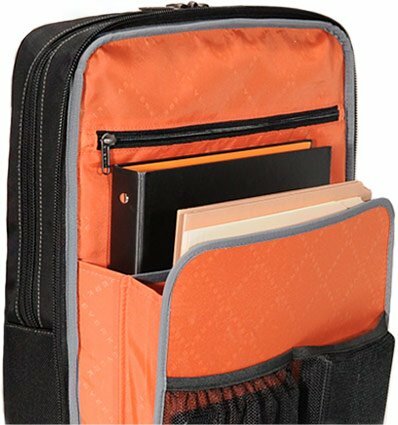 There’s also a file organizer to keep documents and important papers from being folded, and in the front, a dedicated iPad Pro/tablet pocket with super-soft, high contrast orange felt to protect against scratches and nicks. Yeah, you can take that too. Never again will your files and important papers end up a wrinkled mess because they’re in the same compartment as your laptop and power brick. Keep documents and papers neat and organized in the separate file organizer. You don’t want your power brick to get in the way or become a tangled mess. 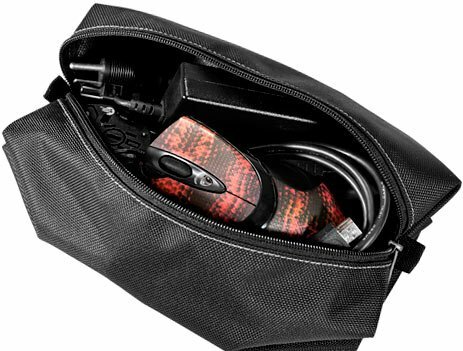 That’s why we designed the Accessories Pouch to separate peripherals like a mouse, chargers, power supplies and cables from your more sensitive items. Traveling with your headphones? 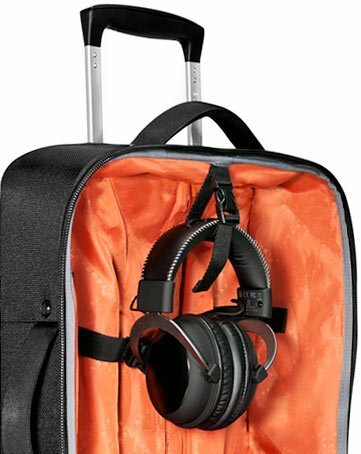 A dedicated strap in the main compartment allows you to hang your headphones securely in place, without falling to the bottom of the bag. A place for everything and everything in its place. External pockets are handy for carrying water and other frequently used items, but can sometimes be unsightly. 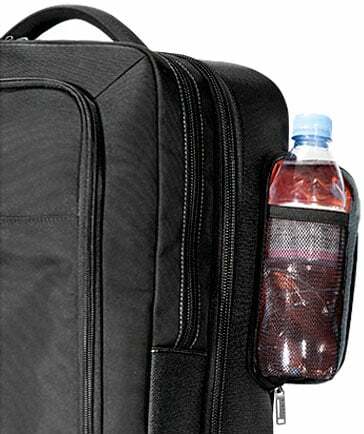 That’s why we designed the external water bottle pocket on the Titan Trolley with a full zipper. Discreet, yet accessible. To start, I would like to congratulate you for making a beautiful trolley. I had been using a back pack for my travels until I recently bought a bigger computer. Between the new size and weight and carrying a work computer as well it was too much on my back. I quickly ordered your Titan Trolley a few days or the day of its release. Now I travel for a living and right now after owning the bag for a month I am writing a review while I am 7000 miles from home. The bag is very well built and durable, the wheels are smooth and the little features are all very nice additions to the bag. The main computer sleeve is perfect protection for my personal computer and my rarely used work computer also is safe strapped in the main compartment. The water bottle holder will hold a large Fuji bottle with a little pushing around. The outside magnetic held pocket is great for my kindle. I like the one hidden pocket inside the main compartment. It lets me safely hide things I do not want seen when I open the main compartment. The headphone holder was a good idea but not as useful as you would think. I do not use it because my headphones fold and I would rather use the space in other ways. All around for quality, design and appearance I give it 5 stars. BTW it replaced a Tumi backpack, this is my first Everki product. Probably the best solution for 18.4" laptops currently in the market. I managed to get this and brought my 18.4" gaming laptop along with my work laptop on overseas trips. Definitely more convenient for checkpoints and less strenuous for my shoulders! The 2 wheel version is good but I would have preferred a 4-wheel version for better maneuvers along with my larger luggage trolley. I have a 17 inch gaming class laptop (for VR development). After extensive research I determined that Everki had the best product to suit my needs, as I often have to cart a very heavy and large laptop along with VR equipment. Although the product is expensive, it has turned out to be a worthwhile investment. It's extremely well made. The design is carefully thought through (though I do have a suggestion that Everki should seriously consider). The product matches airline regulations for carry-on bags; so no problems of being forced to have to check-in - you can just take it onto the plane. I do have one recommendation for the Everki product development folks - please make the wheel diameter a bit larger. I know there's a tradeoff between wheel diameter and interior volume of the larger compartment, but it's one that will serve customers well. 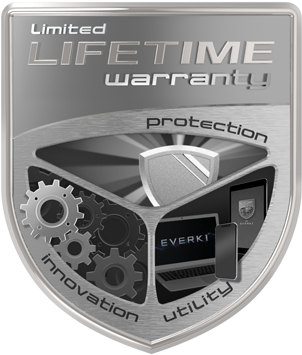 Having a lifetime warranty is another benefit (be sure to hold on to your purchase receipts). All in all, if your needs are for regularly carting around large heavy laptops, the Titan Trolley is really the only no-compromise product to do the job. It's a high price, but totally worth the investment.